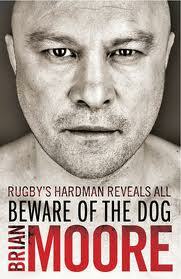 Brian Moore's remarkable autobiography does indeed 'hit you like a sledgehammer' (Rugby World). He is brutally honest both with and about himself. Although much of his adult life has been in the physically brutal world of top class rugby, the real brutality of the book is the stark telling of the sexual abuse he suffered by a family friend and its ongoing consequences. Add to that coming to terms with being adopted, and his anger which is never far below he surface, and then the sudden emptiness of his life after a stellar international rugby career, and his perhaps almost inevitable, marital failures. It is a salutary read, but a fascinating story. Many of his descriptions of incidents during matches left me wincing and glad that I was a nancy three-quarter in the days when we didn't feel obliged to get involved in rucking, mauling and other dark arts! His reflections about adoption are helpful and cautionary, especially as regards the merits or otherwise, of tracing birth parents. He still admits to some confusion over his own adoption, but nonetheless speaks lovingly of his adoptive parents, both of whom were Methodist lay preachers. Retirement for top sportspeople brings a gaping hole for most. This was highlighted very recently when Piers Morgan interviewed Dame Kelly Holmes. This was no less true for Moore whose world almost fell apart when he realised he had poured all of his energy and self worth into being a hard man, super fit, and top of the tree rugby player. But he has since adapted to the wonder of fatherhood and a career as a journalist and rugby pundit. This in addition to writing about and enjoying wine, as well as the thrill of skiing-he had not skied during his rugby paying days for fear of injury. it was fatherhood that brought to the surface the unresolved sadness and pain of 'abandonment and abuse' Moore's words). His honesty and self-awareness are striking. Interestingly he mentions that when his first autobiography came out in 1996 he had not seriously begun to face up to the effects of his abuse and adoption, and in that sense it contained truth, but not the whole truth. It's perhaps one reason why people should wait a while before writing an autobiography. It's one of the things that troubles me when I hear that a guest on Desert Island Discs is only 29 years old. 'But you haven't lived' I want to yell at the radio. Ok so Moore's 'only' 50 years old-I think I'll concede that the beginning of the understanding of life may begin at about that age!